Folds don’t just fall without purpose — there are reasons why cloth pulls and moves on your fashion figure. When material moves in different directions (because you’ve drawn a fashion figure really working it), folds appear! The placement and appearance of the folds partly depends on how you’ve drawn your fashion figure, because the folds show areas where the fabric is stretched or compressed. Include folds when you draw a shirt tucked into another garment, a super tight piece of clothing, or a gathered or draped piece of clothing. The type of fabric also affects the draping. Lighter fabrics that fall loosely (like chiffons, light cottons, silk, and thin flannels) move more than stiffer, heavier fabrics (like leather, suitings, and wool). As you draw a fashion figure striking a fierce pose, include some key folds. Look at fashion magazines or watch clips of runway models strutting their stuff to check out how the fabric falls against the elbows, knees, crotch, chest, and hips; you need to draw only one or two lines or curves to convey movement. Don’t draw too many fashion folds, or your drawings will look overworked and confusing. When you draw a clothed fashion figure, folds most commonly form at bended areas such as at the waist, hip, crotch, elbows, and knees. 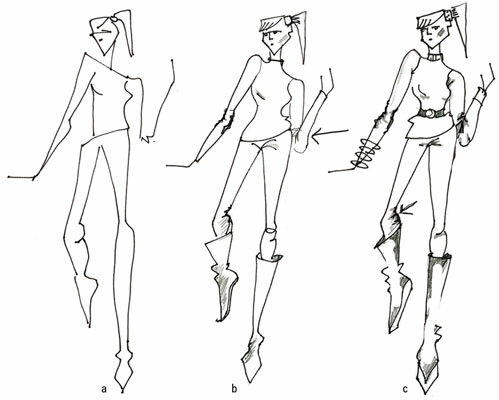 Sketch a fashion figure with her right elbow and leg bent. Dress her in a simple shirt and pants. Draw a few curved lines going inside the shirt where the elbow bends, and add some curved lines outside the elbow to show the folds. Drawing curves is an awesome way to show the folds in fabric. Draw some curves where the knee bends the same way you drew them for the elbow. Add some curves for the breasts and crotch area. Add shading around the fold lines to show depth in the fabric.